While the original system worked well, the semi-flexible solar panels were sourced from a factory in China. They had great specs and a reasonable price (if you take out the rather huge shipping costs!) They were similar to regular glass faced panels, but were a sandwich of aluminum and a special plastic instead of the glass. They weighed ALOT less than traditional solar panels. 7-8 lbs. vs 20-35 lbs! And the best part? They could be adhered to the roof with a special adhesive that I sourced from 3M. No holes drilled in the roof. They were only 3mm thick and flexible enough to be able to follow the gentle curves of the roof. After almost 3 years they showed NO signs of coming off or even a single gap around the edges. While they are semi-flexible and worked well, there was a flaw in the design. The anodized aluminum the panel was based on slowly began to corrode. Inside the panel the aluminum was starting to touch the internal connecting wires between each solar cell. Once this happened, the entire panel was one gigantic electrical short. This means it was effectively dead. No power. I had some very expensive roof coverings on my RV and was no longer even partially self sufficient. Everything else in the system was still functioning perfectly. 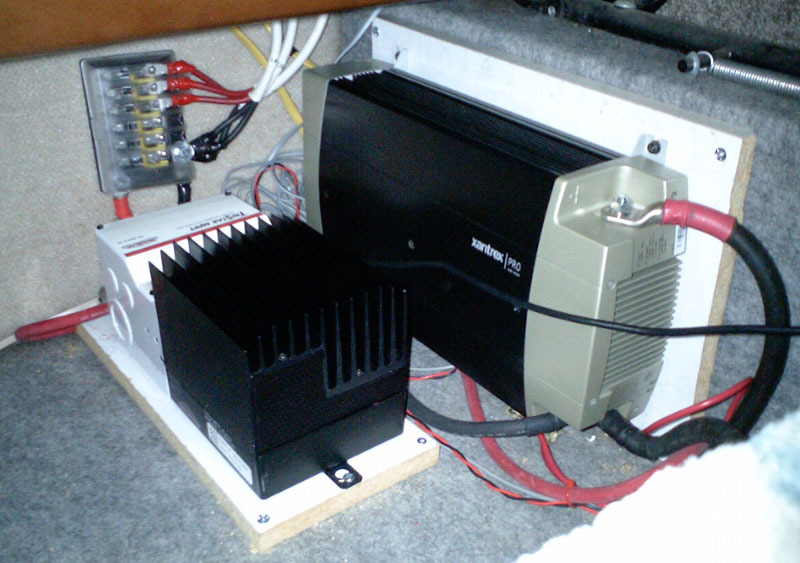 No complaints about the charging controller, the wiring, the fuses and fuse panels at all. But without the solar panels supplying electricity, the whole system was down. I began to look into finding another manufacturer to create a better solar panel, one that wouldn't short out internally and that spoke English! After several false starts (see this article for a possible, why). I found one only a few miles from my home base. They actually manufacture solar panels in great quantities for large projects. I wish I had known they existed before!! After explaining the problem to them and showing the old panels to the boss, they began to figure out a better solution. After a couple of weeks they came up with a solution. I know it sounds simple, but it really isn't! They figured, rightly so, that removing the aluminum from the sandwich would solve the problem at its' most basic level. Now they had to figure out how to do that while maintaining the strength of the solar panel itself. Since it will be glued tight to the roof of the RV, it can be a bit more flexible before it is installed. They experimented with a bunch of different materials for the sandwich until they had a set of working prototypes ready. To say that I was excited to see them was an understatement! Upon arriving at the factory, I was first treated to a tour. REALLY, high tech... just the way you'd imagine a solar technology factory to be. They showed me all the test pieces they had made. Including all the failures. I had no idea what went into manufacturing a quality solar panel. I do now! The "finished" prototypes were beautiful. Thin, flexible and light. They power and efficiency testing they had done showed they would produce more power than the old China sourced aluminum failed ones and take up a bit less space. Score! We transported them back to my home base to be installed (temporarily, no adhesive) on the roof to do some testing. The main difference is these are a lower voltage than the old panels. The old ones were 36V nominal. These are 24V nominal. I wanted to fully test their outputs through the MPPT controller before we decided to keep the design. Also, the third panel had a different measurement and number of cells, I would pick this one up later on for testing. We just used some painters blue tape to attach them to the roof over the existing panels. This would work for power testing, but I knew we'd have to remove the old ones before the permanent install. Since the 3M paralastic adhesive is incredibly strong and "stretchy," I KNEW the removal was going to be really difficult. Likely I would be destroying the (admittedly already dead) aluminum backed panels during the process. There was also the question as to whether the new backing material would be compatible with the adhesive. Tune in next week for a report on our progress. We'll have a week or so of testing with the first two panels, taken delivery of the third and removed the old aluminum ones. So far everything seems to be on track. As most of you already know, Murphy was an optimist! Stay tuned...we may be able to offer this as a complete system with installation. But first have to make sure it performs as well as the old version! Can't wait to read about it! Just getting into rv'ing ourselves. Have LED bulbs for inside & out being shipped to us as I type. Got a '87 class c 27' ford mallard early last year, thankfully for free from a friend, & have been updating it ever since. It was a project we didn't rush (we have hot rods that are a bit more of a priority) & I've been researching & learning. I'll finish sealing the windows/room/seams this Friday and it gets new exhaust this weekend. Should be taking it out for it's maiden voyage in the next couple weeks. An EGGciting New Breakfast Gadget! I Found It! A Better TPMS Deal - YMMV.